Oh what a shame – 11 minutes away from a clean sheet! A Blackburn free kick is cleared out to David Dunn, who heads back in to the danger area. 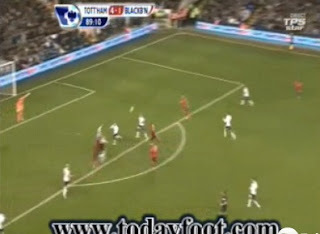 Pavlyuchenko at this point decides to leave him, and is instead positioning himself to receive the ball for a counter. Crouch gets up above Samba to win the header (which he did fairly well for most of the game). 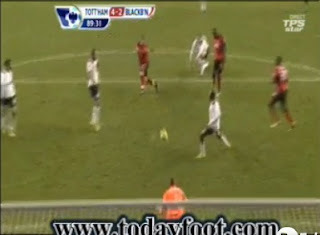 He doesn’t manage to get much distance on the header, though, and it drops to Jenas’ feet. He adjusts quickly, and manages to divert the ball away from Roberts. But Dunn has followed in, and we don’t have anyone protecting the edge of the box. He strikes it well, but the shot is going wide of Gomes’ left-hand post. Ryan Nelsen sticks out a foot, and manages to divert the ball into the corner. Absolutely no chance for Gomes. 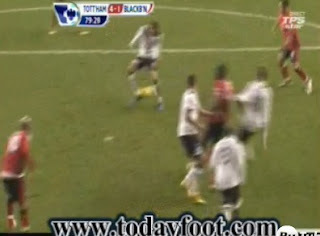 Between the two goals, Blackburn had a couple of chances, including Kaboul clearing off the line from Diouf. On 89 minutes they got a second to give us a slightly nervous finale. Nelsen fires a long ball forward. 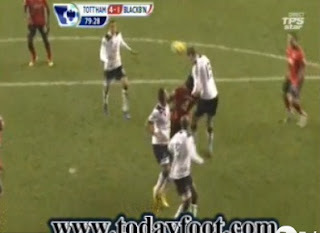 Samba and Crouch compete in the air again, with Gallas covering behind. 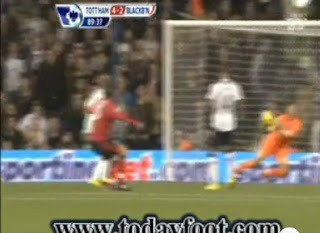 This time Samba wins the flick on, and the ball comes to Gallas quite quickly. In my opinion, though, he should either be leaving this for Gomes, or nodding the ball to Hutton. Instead he heads the ball weakly to the edge of the box, where Givet is waiting – again, not enough protection in this area. He is a very clean striker of the ball, and connects well. But it is literally straight at Gomes. And he makes a mess of it – diving out of the way, only able to divert it slightly. A real shame that we gave up the opportunity to improve our goal difference, through sloppy defending and missed chances (I’m looking at you, Mr Pavlyuchenko). On the whole, though, it was a positive performance, with plenty of good attacking football. As an aside, it was a game featuring two former-Spurs – Paul Robinson, who got an excellent reception, and Pascal Chimbonda, who didn’t. Chimbonda was right in Pavlyuchenko’s face before and after the missed penalty, so I was pleased to see Bale beat him so well for the second goal. I normally enjoy your analysis but you seem to have taken the direct whingy route on yesterday. Poor. Get back to the dispassionate analyisis please. Anon @ 16:25 - where do I blame Pavlyuchenko? I simply stated the facts. I thought he had an excellent game yesterday, misses aside. Anon @ 16:53 - odd - I was very happy with yesterday's performance, just disappointed not to see a clean shet. I am disappointed,too,for not getting a clean sheet. Why do we keep conceding silly goals so often? Goal difference is important. Had we not conceded those two goals, we would now be above Sunderland and Bolton in 5th. position.. The first goal IMO is just one of those things. 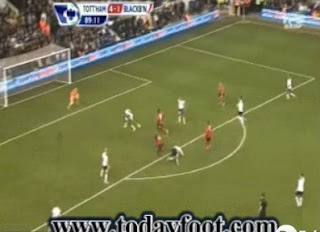 The second though, as you said should've been easily cleared instead of headed weakly to the edge of our area by Gallas. I wasn't one of those who didn't like the signing because of who he used to play for, I didn't like it because I didn't rate him. It's simple schoolboy errors like that which have proved many right unfortunately. Not a big Gallas fan. Can't wait to get Dawson back someday.